Antonio Salieri (1750-1825), the long-lived composer of nearly 50 Italian operas during the golden years of Viennese classicism, whose works symbolize much of that era, is seldom heard today. Lowell House Opera’s production of his La grotta di Trofonio, an American premiere of an opera buffa popular in Vienna in 1785 that faded by 1788, offered a handsome introduction to a sizable forgotten oeuvre that warrants reevaluation. The run continues through April 2nd. My first notice of the myth of the “Cave of Trophonios” came in a college philosophy course. As classically presented by the second-century geographer Pausanias, it pertained to a subterranean oracle who could only be accessed by entering a cave; the oracle would then seize the intrepid entrant bodily before a consultation could be delivered. In Salieri’s comic version (on a libretto by G. B. Casti), whoever is unlucky enough to be enticed into the cave suffers an instantaneous 180-degree reversal of personality. Plistene, the boisterous bon vivant, pledged to the equally vivacious Dori, swaps personalities with the ruminative and philosophical Artemidoro, who is pledged to the calmly proper Ofelia. The girls are vexed by this abrupt inversion and demand cancellation of the marriage contract already negotiated by their patient but equally baffled father, Aristone. In Mozart’s Così fan tutte the confusion is wrought in disguises and tests of faithfulness; in La grotta di Trofonio it results from incautious spelunking, precipitated by Trofonio himself, accompanied by thunder and lightning and a subterranean chorus of spirits (very like those in Gluck’s Orfeo ed Euridice). There is a lot of fast-tempo argument, but all gets sorted out in the end, the lovers are reunited in truth and troth, and the final scene has the girls, the guys and the paterfamilias fleeing in terror from the cave while Trofonio, alone on stage, declares his primacy over the gods of the underworld. The story seems silly enough today, but it is genuinely operatic, and the music goes far beyond mere frivolity and into the realm of real drama; the melodic writing and pacing are everywhere bright and ingenious; the overall sound expert and brilliant. The structure is entirely conventional for the time — arias, ariosos, and ensembles separated by secco recitative, with an accelerating finale in each act. It is very refreshing to find this opera brought back from oblivion, and certainly not just so we have some idea of Mozart’s contemporary. There is good evidence that Mozart remembered La grotta di Trofonio; the amount of stormy D minor in the Trofonio scenes reminds one of Don Giovanni’s two confrontations with the Commendatore (and several decades later of the Wolf’s Glen in Der Freischütz), and, as Edward Jones’s expert program notes observe, there are parallel characters in Figaro and Così that extend beyond Mozart’s knowledge of the expert singers whom he knew personally. Salieri, whose reputation has been battered in the popular press, in an opera by Rimsky-Korsakov, and in Peter Schaffer’s Amadeus, was Mozart’s rival but also his colleague and friend, and as both a composer and a professional man of the theater he was an expert of high competence and experience. He was also a teacher who counted nearly every major Viennese composer of his time among his pupils; I think especially of Schubert, 47 years younger, who profited significantly from Salieri’s instruction during the most productive years of his early development, noticeably in his Mass in F Major D. 105 (1814). When I heard the fortissimo C minor octaves of the overture to La grotta I thought immediately of Schubert’s greatest Italian overture, Die Zauberharfe, D 644. In its 78th year, LHO can look back on a distinguished history of inspired productions combining students and young freelance professionals, as I wrote about two years ago for Lakmé [here]. La grotta di Trofonio, in two hour-long acts, requires no complex staging. The simple split-level scene depicting Arcadian Greece featured Doric columns on the left, and rocky crags with cave entrance and exits on the right. Costuming was classical — togas, shepherds — for all the principals except the “wizened and reclusive philosopher” Trofonio, a classical hippie, who was imaginatively cloaked in rags, ivy leaves, and Christmas ferns (he gave these to the girls when they emerged from the cave). 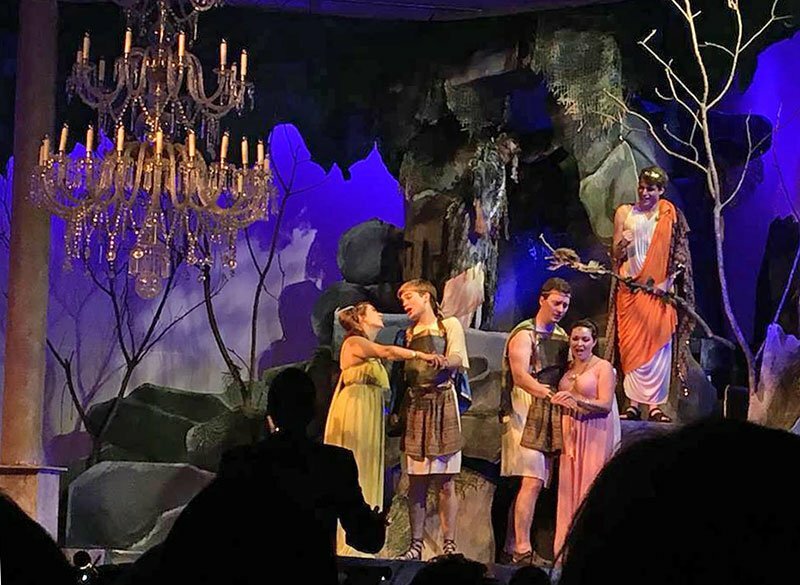 The opera has been double-cast for six performances, but all of those whom I heard were good actors as well as good singers, and well prepared in their roles — Ethan Sagin (Aristone), Sarah Mitchell (Dori), Charlotte McKechnie ‘15 (Ofelia), Andy Troska ‘17 (Artemidoro; he was also Tom Rakewell just a few weeks ago; when does he find time for his courses? ), and Andrew Sokol (Plistene). I was especially impressed by Nyiko Ngobeni as the less prominent but all-important Trofonio, whose voice was strong and clear, but who combined his stage presence with a fine blend of both menace and humor. The orchestra (1-2-2-2, 2-2-0-0, timpani, strings) was a little ragged at the start but quickly settled into a comfortable and confident sound. Some especially radiant moments included Artemidoro’s wandering through the woods contemplating nature and Plato simultaneously as the birds sing to him with the flute, oboe, and solo violin; several times the rich sound of low-register clarinets made me wonder whether Salieri had had basset horns in mind. I missed the timpani tuned in the interval of a tritone, but this is a notable forerunner of similar timpani in the dungeon scene in Beethoven’s Fidelio (1814). The entire ensemble was expertly kept together by Edward Elwyn Jones, who is also the University Organist and Choirmaster. He directed from the fortepiano, on which he also provided the accompaniment for the recitatives. Hats off to him especially for this beautifully coordinated production, and also to Roxanna Myhrum, stage director, now in her fifth season with Lowell House Opera. I second Mark’s review; just to add a few brief notes. (1) Blame Pushkin for writing the play that started the story that Salieri tried to poison Mozart–and that is why Rimsky-Korsakov would turn it into a short opera. (2) I sat near the front on Friday 3/25 and found the supertitles’ location high up in the upper left and right corners of what passed for a proscenium a bit too awkward; I eventually used them only as a last resort to clarify what might be happening on the stage. Probably those in the back (you NEED to see this work, People, come!) had an easier time of it. Occasionally the supertitles got out of sync with the action. (3) Every so often the sound balance got uneven and the orchestra would suddenly drown out the singers for a few bars. The physical layout of the staging may have had something to do with this. Curiously I remember no such problems with Pikovaya Dama last year. A fellow audience member pointed out to me that Lowell House Opera does get some “extremely” young singers (think semi-amateur Gilbert & Sullivan) and that might have something to do with uneveness. Still, we owe a debt of great gratitude for Lowell House Opera for bringing us this opportunity to hear and see Salieri staged. It’s a great show and well worth the time to enlarge one’s knowledge and feel for the theater of the period. My take on Salieri as a composer is that he over-orchestrates and his tone color gets garish at times–the instrumentation is plastered on rather than being stained into the wood; of course having lived for decades on a steady diet of Haydn (all 107 symphonies, 4 operas, etc.) and having Mozart (mostly juvenile) drummed into us by WCRB we take them as the normal style for the period. What Lowell House Opera has done is show us what the Viennese theatrical world was actually like–plus giving us a d**n good bit of entertainment. In short–make tracks to Trofonio’s Grotto; never mind the change in your peronality–that wears off after awhile; your friends will still like you and get them to come too.